Established in 1985 Impress has emerged as one of KwaZulu-Natal’s leading printing houses. 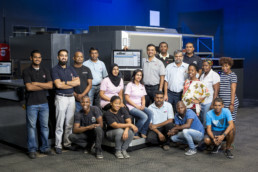 Now a medium-sized printing specialist, this Durban-based company started off with just a single one-colour printing machine – and has never looked back. The company’s exceptional growth has seen it move premises four times since inception. Impress Printers are Professional Printers in Durban. From Queen Street to Saville Street, then to Grantham Place and eventually to Intersite Avenue in Umgeni Business Park. Having invested in web offset presses and and several eight colour presses; Impress has been able to constantly match and track the market demand. In addition to high volume web printing, Impress has recognised the tremendous demand for shorter run, photo quality printing in the form of digital printing. This means that Impress is equipped and able to deliver the full range of printing services to the to the discerning buyer, no matter what their printing requirements are. Impress Printers has delivered reliable, innovative and highly professional managed print services to businesses of all sizes for over 30 years. Our strategy is to invest in the latest technology, our team, and processes to ensure our service to our customers is consistent, reliable and professional, making us not only one of Kwazulu Natal’s leading commercial printers but also a trusted partner in print. Through the above we protect brands and reduce the administrative burden of managing print, in turn transforming your print into a real competitive advantage. Why not invest a little time and arrange to come and see us at our factory in Umgeni Park, Durban and see first hand what we can add to your current print service. With over 30 years experience in the printing industry, our team of specialists are equipped and ready to realise your print communication objectives. Our Youthful spirit is up for the challenge of realising your printing conundrums, and no job is too big or too small.Our curious minds will feed on the possibilities until we solve your challenge. We love what we do and we do it well. We offer unmatched photo print quality from single quantities with our HP Indigo Press 5500 - to major runs on our flagship web Harris M600 and our burgeoning B2 Indigo 10 000, and everything in between. With every project that we take on, our team comes together to ensure a seamless coordination - from imposition and planning, through the printing and finishing departments. With over 30 years experience in the industry, we have a wealth of knowledge to draw on to help you materialise your project. Your brand and print productions are nurtured through every step in the printing process - by our experienced staff who lie at the heart of the company.